Well, I can't fathom it. I don't mind admitting defeat. I don't. I just don't get. 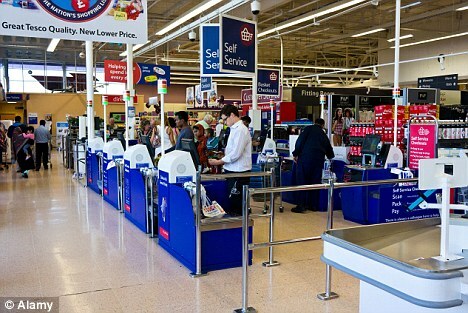 First, Tesco's Self Service Checkouts blew my mind ........ and then, I found out about Waitrose's "QuickCheck" scanners. As a matter of interest, any of you been in Tesco at Fforestfach, Swansea over the past 4 weeks? If so, you might have spotted me giving those Self-Service Checkouts some of my best Paddington Bear stares. I can assure you I have done some of my best work vis a vis the Stern Look. Let me explain, to the uninitiated, how these all-seeing, mind-controlling monstrosities work. You take your basket of, say, 8 items. You scan 8 items. It asks you how bags you need. You tell It. You finish scanning. You pay the Thing. You leave. With your 8 items. HOW does It know you didn't have 9 items in your basket but, because you are an evil genius, you have *gasp* .......*whispers* .... not scanned the 9th item. Opting instead (WARNING: those of a nervous disposition look away now) to put it straight into your bag. And, HOW does that Thing know you haven't taken 4 bags (having led It to believe you took just the one). One of you and one each for your 3 friends, who are in on this Oceans Eleven scam. Or who don't want to donate 2p per bag to Children In Need, Snails with Asthma or whatever. And then, Waitrose went one louder with its Quick Check scanner. Now, wait for this, the QCS encourages you to, AS you make way around the shop, to scan your FreeRange Eggs and then POP THEM STRAIGHT IN YOUR BAG and then, pay for the cumulative amount recorded on your scanner at the end. No feverish packing at a till, whilst juggling cards. All done. But again, it seems to me that it would be really easy to just squirrel away an unscanned item, or two. Should you have a Faganesque inclination. b) is it a case of playing on GP's sense of paranoia or its fear of public exposure, in a supermarket, of being a Bad Egg. The Infallible Duo of a Catholic upbringing and one of the original Tiger Mums has put me in possession of a disportionate guilt complex re the breaking of rules and has rendered me incapable of telling lies (white or otherwise) to authorities. AT THE CINEMA "Madam, have you got contrabrand English Breakfast tea in a travel mug, in your bag?" Voices in the Head: "Say no, you dosy cow. Say no." Would you half-inch a packet of hobnobs? No. And neither would most folk, because they are mostly moral members of the tribe. The ones who would were already doing it anyway.